The Samsung HW-N950 soundbar combines excellent Dolby Atmos and DTS:X support with a genuine 7.1.4-channel performance, thanks to a wireless subwoofer and rear speakers. Solid build quality and a decent set of features help justify the price tag, with only a lack of room equalisation and the number of HDMI ports worth criticising. The Samsung HW-N950 is the Korean manufacturer's flagship soundbar, and the first to benefit from Samsung's acquisition of Harman Kardon. The N950 not only supports Dolby Atmos and DTS:X, but also offers a genuine immersive audio experience thanks to a wireless subwoofer and rear speakers included in the package. The Samsung HW-N950 looks like the rest of the manufacturer's high-end soundbars, with an attractive and minimalist design. The build quality is excellent, and the soundbar itself uses black metal grilles for the top, front and sides. These are combined with black brushed metal edges and rear panel, resulting in a tasteful-looking unit that doesn't draw excessive attention to itself. That's just as well because the soundbar is fairly big, clearly designed for larger TVs of 55-inches and up. The N950 is fairly discreet at 83mm, though, so shouldn't block your screen (if it does, Samsung includes a dedicated bracket for wall mounting beneath your TV). It isn't just the design that matches Samsung's other speakers, the simple front-facing LED display is also identical. It's located on the front far right of the main unit, and lights up whenever the soundbar receives a command, providing information on the volume level, the selected input and various other settings. The N950 includes a wireless subwoofer that uses a bass-reflex design, with a side-firing 8-inch driver and built-in amplification. The wireless rear speakers also tie-in with the overall aesthetic, complete with metal grilles on the front and top, and a black brushed metal finish. The main reason for buying the Samsung HW-N950 is its support for Dolby Atmos and DTS:X. While it's not the only soundbar to decode both immersive audio formats, it is the only one to do so using a genuine 7.1.4 speaker configuration. That means the N950 uses actual speakers to immerse the listener, rather than sound beams, psychoacoustics or virtual processing. This layout consists of 11 individually amplified speakers built around a total of 17 drivers, plus the subwoofer. There are three drivers each in the front left, centre, and right channels – two woofers and a wide range tweeter – with the remaining eight channels all using a single driver each. In total there is 512W of amplification, with every speaker possessing its own amplification. The claimed frequency response of the whole system goes from 34Hz to 17kHz, although we'd be surprised if the subwoofer is able to go that low in reality. As with Samsung's other soundbars, the HW-N950 includes a number of sound modes which enhance your listening experience by applying digital signal processing (DSP). There are three modes: Standard, which decodes the incoming audio with no changes; Surround Sound Expansion, which upmixes audio to take advantage of all the available speakers; and Smart, which analyses the incoming signal, and automatically chooses the best processing. Samsung has also embraced voice control using Amazon Alexa (note, it's not Bixby, as found on Samsung phones). All you need to do is setup the N950 via the Skills in the Alexa app, enable Samsung Wireless Audio, then select devices in Smart Home and discover the N950. This will enable the 3PDA skills and you can start controlling your N950 by simply using your voice. Voice control is still developing, but it does work as long as Alexa understands the nature of your command. The Samsung HW-N950 houses all of its physical connections in a recessed section on the underside of the soundbar. There are two HDMI ports, but as these days it's easy to have more lossless audio sources we'd like to have seen more (four'd be nice!). There's also an optical digital audio input, along with a USB port for service updates, and a connector for the two-pin power cable. Since there are only two HDMI inputs, we recommend using those for sources like Blu-ray players and games consoles, both of which offer lossless soundtracks. You can then connect your remaining sources to your TV and send their audio back to the soundbar using ARC. Since Dolby Atmos can be delivered via Dolby Digital Plus, it is possible to send an Atmos track back to the soundbar via ARC. However for DTS:X, you'll need to connect the source directly to the N950 via HDMI. The minimalist nature of the N950 extends to the controls on the soundbar itself. They're located on the top of the unit, towards the rear centre, and amount to just a few basic touch-sensitive buttons for power, input selection and volume. The included remote is simple, too, offering a central navigation and play/pause control, along with a button for setting the treble, bass, audio sync, and levels of the various speakers (including control for setting the subwoofer level). The Samsung HW-N950 is very easy to setup, which immediately gives it an advantage over a comparable separates system. All you need to do is position the soundbar under your TV and place the subwoofer at the front of the room and slightly away from the wall and it'll automatically connect once powered. In terms of wireless connections, the N950 includes built-in Bluetooth and Wi-Fi, allowing you to stream music from your home network or via third-party services. The Bluetooth connection can be setup by just pressing the pairing button on the remote control, while the Wi-Fi connection is simply setup using Samsung's SmartThings app. The wireless rear speakers are best positioned at the back of the room, either side of and just behind the main seating position. They can be placed on a shelf or a stand, and there are screw fixings for wall mounting. Since the rears are wireless, there's no need to run cables to the front of the room but, just like the subwoofer, you will need to plug them into another power socket. There are indicator LEDs that show when the speakers are in standby or paired with the soundbar. Although easy to setup, it would be nice if there was some type of automated room equalisation system. Many other soundbars include a dedicated microphone or setup app for just such a purpose. Perhaps now that Samsung owns Harman Kardon, a more sophisticated setup and room EQ feature can be added in the future. The Samsung HW-N950 is a very impressive soundbar, regardless of whether you're using it for music, TV shows, or movies. Of course, what sets this soundbar apart from the competition is its ability to deliver a genuinely immersive audio experience using that 7.1.4 speaker layout. However, the majority of content currently doesn't use object-based audio, so the N950's performance with regular soundtracks is equally as important. It's immediately clear that Harman Kardon's efforts haven't been wasted when watching movies and telly, with a well defined front soundstage. There's excellent stereo separation, combined with clarity and focused dialogue. Watching the news or a show like The Great British Bakeoff results in voices clearly emanating from the screen, while music spreads to either side. More complex soundtracks, such as the 5.1 mix in Star Wars Rebels, takes full advantage of the Samsung's capabilities, with effects moving around the room seamlessly and the subwoofer adding plenty of low frequency presence. What's particularly impressive is the sense of tonal cohesion; using identical drivers results in a very balanced soundstage, thus the steering of effects is smooth and precise. Gravity is another excellent test of a system's tonal balance, because the highly directional soundtrack often moves voices and effects from one speaker to another. The N950 passes this particular test with flying colours. As good as the N950 is with 2-channel and 5.1/7.1 mixes, where it really delivers is with Dolby Atmos and DTS:X soundtracks (so long as your ceilings aren't too high, as they'll lack a sharp bounce benefit). A Quiet Place has a fantastic Dolby Atmos soundtrack, one that not only makes full use of precisely placed overhead effects, but also delivers some serious dynamic range. The N950 is more than up to both tasks, replicating the subtle atmospheric effects and directional sounds with precision, while also having the power and bass energy to handle the louder sequences. The Samsung proves to be just as adept with DTS:X soundtracks, delivering the same sense of genuine immersion. Atomic Blonde makes full use of this immersion, transporting any listener to late 80s Cold War Berlin. Songs are delivered with verve, dialogue is clear and crisp, and the bone-crunching fight scenes are rendered with real kick. Finally Jurassic Park's new DTS:X mix brings everything together, with an immersive torrential downpour during the storm, precise location of effects as dinosaurs move around in the jungle, clear dialogue as characters deliver exposition, deep bass that heralds the arrival of the T-Rex, and a gut-wrenching roar as it attacks the tour cars. It's a brilliant movie, elevated higher for watching at home with a sound setup such as this. If you're buying the N950, the chances are that what you're interested in is how it sounds with movie soundtracks. However, if you do end up listening to music on this soundbar, you won't be disappointed. Once again Harman Kardon's influence can be heard, with a lovely sense of musicality. The recent 30th Anniversary box set of Appetite for Destruction by Guns 'n' Roses includes 2-channel and 5.1-channel high-resolution audio mixes of the album. The N950 does a fantastic job of aggressively delivering Axl's vocals, while the rhythm section benefited from the presence of the subwoofer. 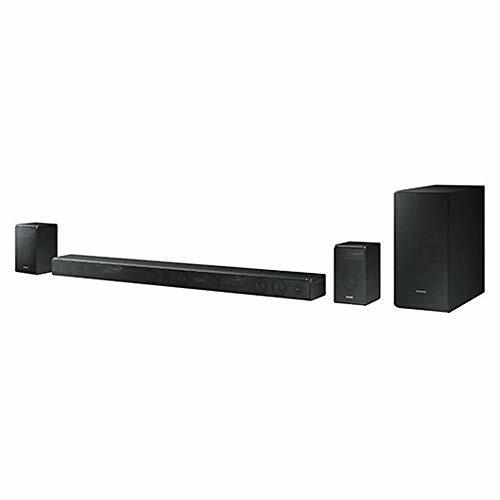 The Samsung HW-N950 is an excellent soundbar, especially if you're looking to easily and conveniently build a genuine 7.1.4 system without a separate AV receiver. That's a full 11 speakers and subwoofer combined from the four-piece package. No other soundbar currently available offers this genuine degree of individual speakers combined with both Dolby Atmos and DTS:X handling. We can't fault the N950 in terms of its performance, delivering superb sound quality with TV shows, movies and music. Of course where it really comes into its own is with Atmos and DTS:X, both of which sound superb. The only real downsides are a lack of room equalisation and that only two HDMI ports are present. Overall, this soundbar package delivers a level of immersion that we've only previously experienced with a separates system... but you'd struggle to build a comparative one for the price of the N950. Which, all in all, makes it pricey but a relative bargain.